Home Juventus Should Claudio Marchisio Replace Andrea Pirlo? The most mystifying managerial hire of any major European Club during the Summer of 2014 was Juventus’ hiring of Massimiliano Allegri. Allegri was hired as Manager of AC Milan in 2010 and his managerial began AC Milan’s downturn that ended when Clarence Seedorf, AC Milan’s caretaker manager, was fired after the team failed to finish in a European place. AC Milan did not compete in the Champions League for the first time since the 2008/2009 season and did not compete in a European Competition for the first time since the 1998/1999 season. During Allegri’s tenure at AC Milan, he ended the AC Milan career of Andrea Pirlo, the player that has come to define the rebirth of Juventus as the best club in Italy. Andrea Pirlo was the heartbeat AC Milan. 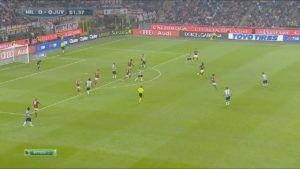 Pirlo sat deep at the bottom of AC Milan’s central midfield in Milan’s Regista (Holding Midfielder) position and pulled the strings of their attack, rotating the ball from side to side and playing his famous direct balls over the top of opposition defensive lines. Pirlo was a once in a generation technical talent; however he was a lightweight player who would be physically overwhelmed in central midfield. Pirlo always needed protection in center midfield and the majority of his career he was flanked by Clarence Seedorf, Gennaro Gattuso, and Massimo Ambrosini. They provided the defensive solidity and work rate that Pirlo lacked and helped balance out AC Milan’s Central Midfield. Allegri preferred to build his central midfield around physical and athletic players, sacrificing technical skill in an attempt to build an AC Milan side that would physically overpower their competition. By the time Allegri was appointed, in the Summer of 2010, Pirlo was already 31 years old. With his physical limitations, and an injury plagued first half of the season Allegri bought a replacement, Mark Van Bommel, during the Winter Transfer Window. Van Bommel was a notorious hardman who played on the fence between physical and dirty play, spending matches trying to physically intimidate and dominate his opposition. At the end of the season, Allegri decided that Pirlo would not be a significant factor in the future of AC Milan and Pirlo’s contract was not renewed for the upcoming season. Juventus F.C. signed Pirlo on a free transfer during the Summer of 2011. At Juventus, Pirlo rejuvenated his career becoming the face of the rebirth of Juventus as the club regained their status as the premier football club in Italy. Juventus went unbeaten in the Serie A for 49 matches, winning the Scudetto three straight times, and making a run to the 2012/2013 Champions League Semifinals.At the beginning of the 2014/2015 season Pirlo was unavailable for the first month of the year after sustaining a hip injury during the 2014 pre-season Trofeo TIM tournament. Allegri chose to play Claudio Marchisio, a very athletic and skilled Central Midfielder, as Juventus‘ starting Regista in Juventus’ preferred 3-5-2 formation that had lead Juventus to success over the last two seasons. Both Marchisio and Pirlo began their careers playing higher up in central midfield and their earlier positions influence how they interpret the Regista position. Pirlo, began his career playing higher in Central Midfield before being pushed deep into the Holding Midfield position. He initially played as a Trequartista, an attacking playmaker who sat in the hole behind his Forward and between the opposition’s midfield and defensive lines. And is primarily a technical player who created scoring opportunities. Pirlo, a physically limited player, struggled higher up the field where he lacked space and had to combat the opposition’s physically superior Defensive Midfielders and Centerbacks. After being moved deep to the Regista position, a deep-lying playmaker who sits in front of his Centerbacks, Pirlo was given more space. Thus, his physical limitations were harder to exploit and he was given the space and freedom to dictate the tempo of AC Milan’s and Juventus’ attacks from deep. Marchisio played the majority of his career as a Central Midfielder, however, his position and role was extremely different than the role Pirlo played. Marchisio has played the majority of his career as a Central Midfielder who interpreted his role by playing as a Box to Box Midfielder. To fulfill this role, Marchisio had to be a complete player. He had to possess the energy levels and athleticism to physically link play between Juventus’ defense and midfield. He had to be comfortable playing deep and undertaking the more pragmatic responsibilities such defensive positioning, tackling, intercepting passes, and blocking shots. He also had to possess the ability to make attacking runs, link play centrally, and to take long shots from deep. 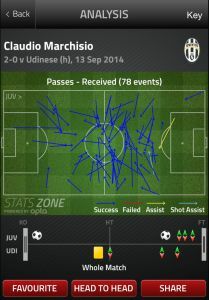 While Pirlo was injured, Marchisio played at an extremely high level and was arguably Juventus’ most important player. He was able to set the tempo for Juventus’ attack, while also acting as a creative force creating six chances from open play, assisting a goal in Juventus’ first Champions League match against Malmö FF, shooting a shot off of the goal post against AC Milan, and scoring a goal against Udinese. Marchisio is comfortable making driving attacking runs from deep in the midfield and with his technical ability he is a threat to create scoring for his teammates or to attempt long shots from deep. This movement forces Juventus’ opposition to diligently mark Marchisio when Juventus is in possession of the ball. 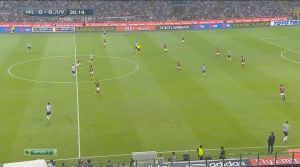 In the September 20, 2014 Serie A match against AC Milan, AC Milan defended against Juventus by playing a compact 4-3-3 press with their midfield three playing narrowly while attempting to mark both of Juventus’ central midfielders and provide defensive cover against Carlos Tevez, who dropped into the hole between AC Milan’s midfield and defensive lines. This forced AC Milan’s Center Forward to drop deep in an attempt to mark Marchisio. 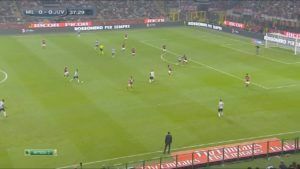 By marking Marchisio with their Center Forward, AC Milan mimicked a defensive strategy that all of Juventus’ opposition have used, regardless of whether Pirlo or Marchisio started. 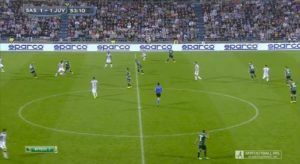 This strategy is based around marking all of Juventus’ Central Midfielders in an attempt to deny them the space and opportunity to build play centrally and force the ball wide. In the images below (top) 92. 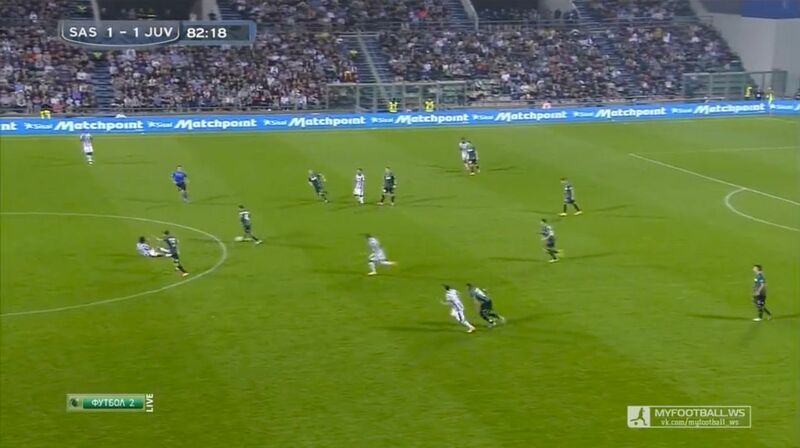 El Shaarawy dropped under Marchisio in an attempt to deny him the opportunity to play the ball forward from deep. 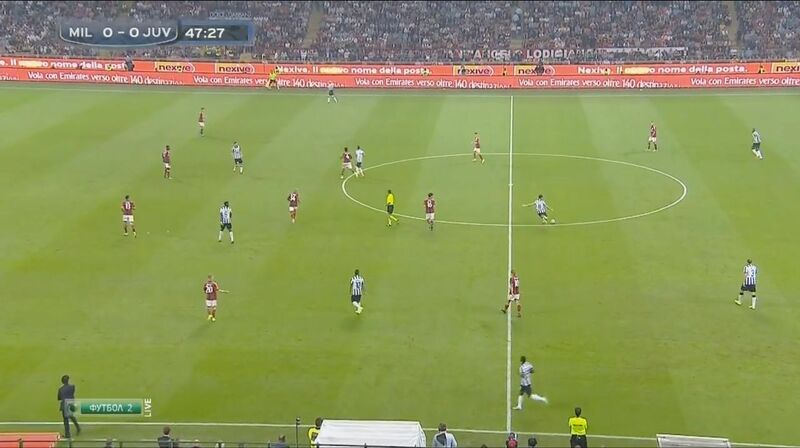 AC Milan played with a narrow central midfield with 4. Sully Muntari marking 37. Roberto Pereyra and 16. Andrea Poli marking 6. Paul Pogba. 34. Nigel De Jong provided cover for AC Milan’s other central midfielders and denied the opportunity for Marchisio to play a pass to 10. Carlos Tevez who had dropped deep between AC Milan’s midfield and defensive lines. Juventus have developed a countermove to create space against defenses that attempt to press and deny space to their Central Midfielders. (bottom) Pereyra drops deep to provide a safe passing option for Marchisio. His movement forces Sully Muntari to also push forward in an attempt to mark Pereyra. Marchisio passed the ball to Pereyra and made a direct run past him into the space that was vacated by Muntari’s advanced run. El Shaarawy was uncomfortable dropping deep and instead of following Marchisio’s run he attempted to close down Pereyra. With the correct return pass from Pereyra, Marchisio would be free in space with the ball against an exposed AC Milan defense. 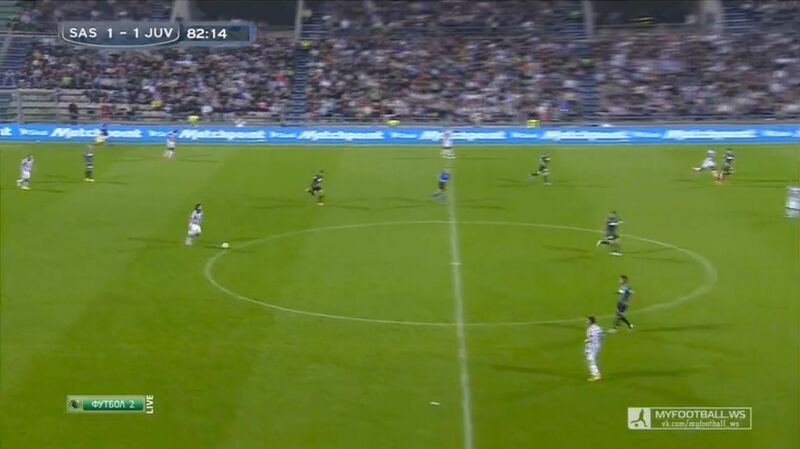 Either one of AC Milan’s deep central midfielders, Sully Muntari or Poli, would be forced to leave the man they were marking to close down Marchisio. 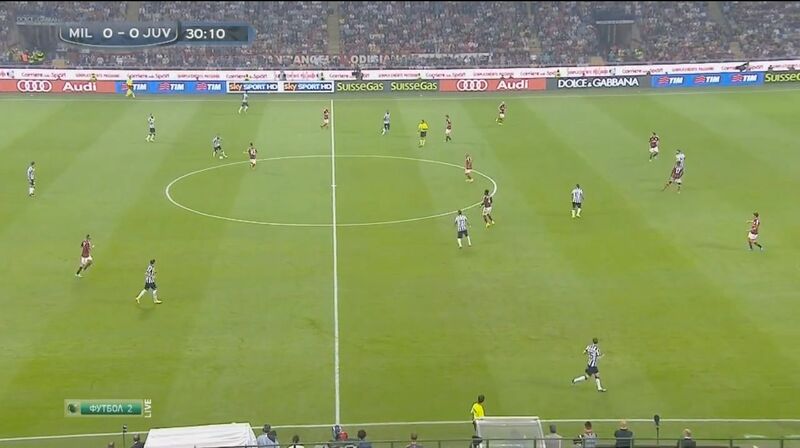 This would leave one of Tevez or Pogba free to attack AC Milan’s high and now exposed defensive line. The biggest attacking weakness of playing with a Back-3 is that when playing a side that plays with one Forward and two Wingers or Wide Midfielders who drop deep to provide cover in their defensive phase, the attacking team plays with an unnecessary central defender as you only need two central defenders to mark a single Forward. This takes away a player that could be used to help the attacking team break down their opposition. With Marchisio being marked in an advanced position, AC Milan’s Center Forward Jérémy Ménez is isolated and there is no need for Juventus to have three Centerbacks deep to mark him. This gives additional freedom to one of Juventus’ Centerbacks In the picture above, 3. Giorgio Chiellini pushes into midfield and to provide Juventus an extra passing option. Marchisio is able to play in attacking position because he has the athleticism to recover defensively if Juventus lose possession of the ball high up the field. He is also able to provide the necessary protection to his Centerbacks who can be exposed and overrun when they are not protected by their advanced Centerbacks. In the image below (top) Juventus has just lost possession of the ball with many of their players high up the field, including their Left Wingback 26. Stephan Lichtsteiner and both of their Central Midfielders. All three are in an advanced position and are not able to provide defensive cover. Mattia De Sciglio, AC Milan’s Left Fullback, quickly tried to advance the ball to Jérémy Ménez who had made a run to the left flank to provide De Sciglio an advanced passing option. De Sciglio passed the ball to Ménez (bottom) who was closely marked by Juventus’ Right Centerback, Angelo Ogbonna. Ménez attempted to quickly pass the ball to El Shaarawy who was free in space to continue AC Milan’s counter attack after making an attacking run from deep. 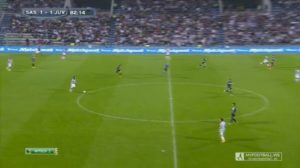 Marchisio was able to make a run from deep into the passing lane between Ménez and El Shaarawy and deflect the ball denying El Shaarawy’s attempt to attack an open and exposed Juventus defense. 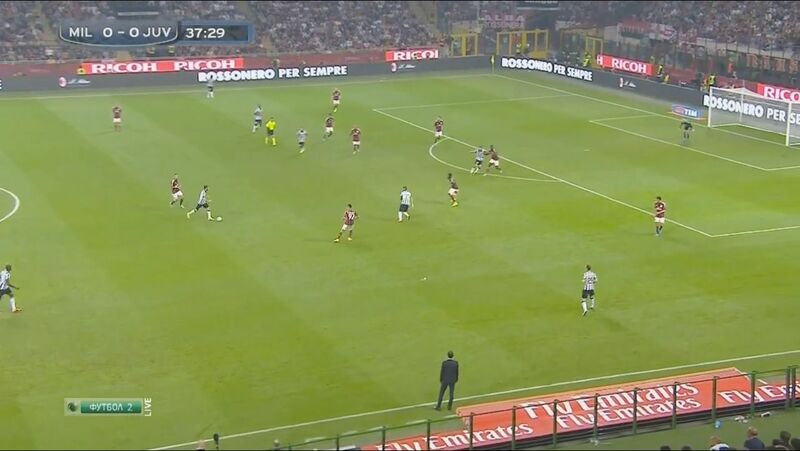 Instead Pirlo attempts to curl a pass to Ogbonna who is making a run down the left flank. 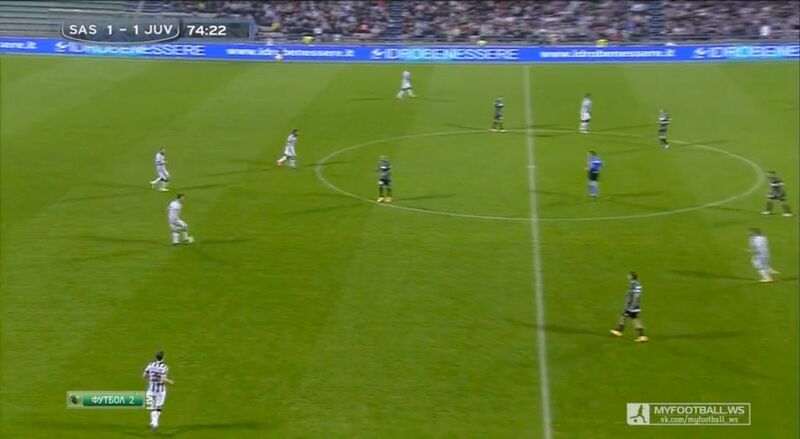 He missed Ogbonna and the ball went out of play leading to a loss of possession and a Sassuolo throw-in. Because Pirlo is now 35 years old and has suffered serious injuries the last two seasons to his right knee and hip, Juventus’ opposition has the opportunity to exploit Pirlo’s physical limitations. In the image below Pirlo is physically overwhelmed by Sassoulo’s defense. 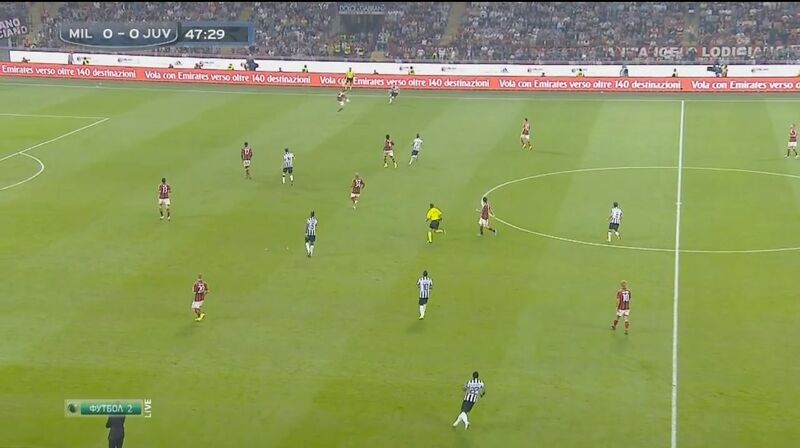 In the image below (top left) after Pirlo regains possession of the ball, he quickly pressed by 25. 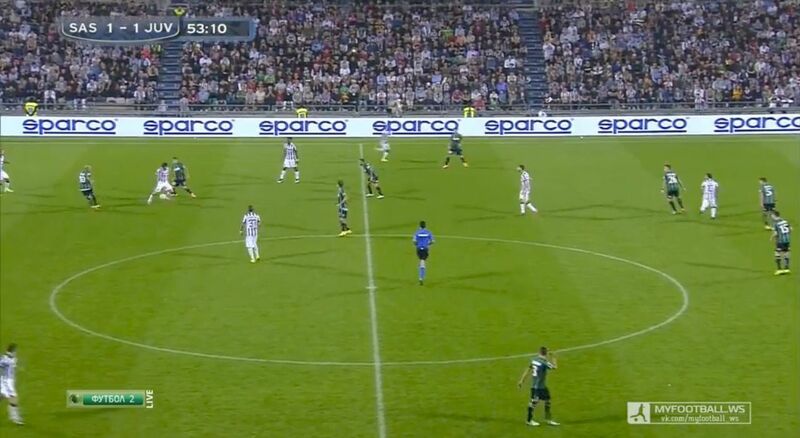 Domenico Berardi, who is able to dispossess Pirlo and initiate a Sussoulo counter attack (top right). 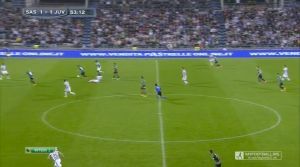 On another occasion Berardi was able to physically overpower Pirlo, (bottom left), Pirlo gains possession of the ball free in space and attempts to lead a Juventus transition attack. 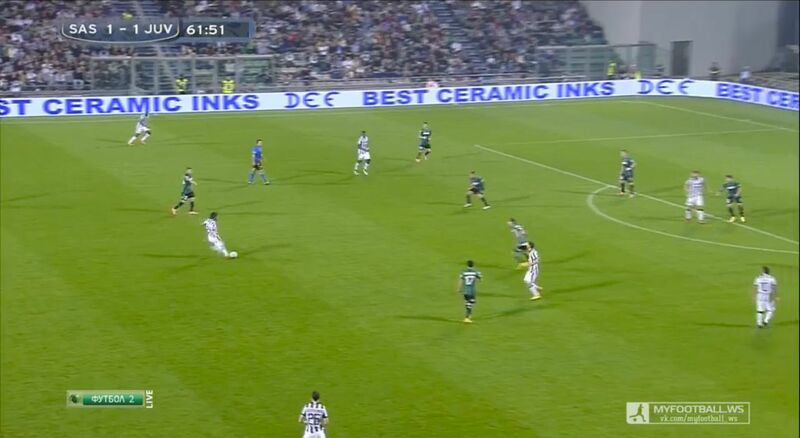 Berardi makes a run from his Right Wing position in an attempt to mark Pirlo. 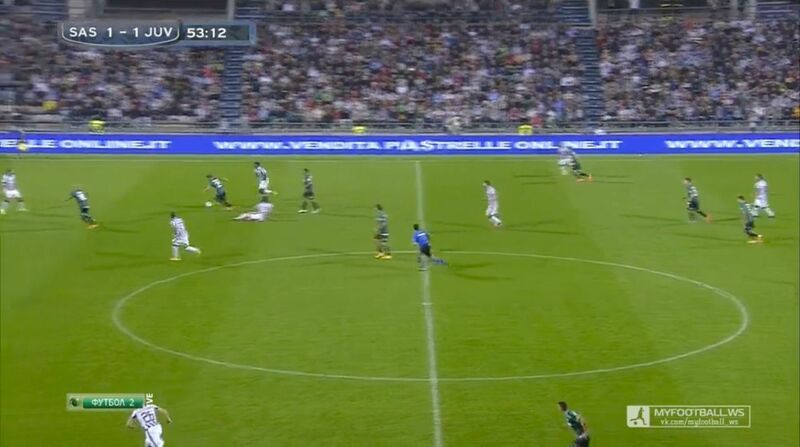 Berardi is able to catch Pirlo and tackle the ball away from him (bottom right) and start a Sassuolo counter attack. 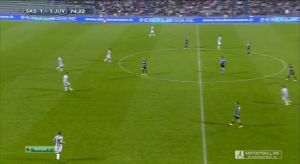 Pirlo is forced to play higher up the field as it is his job to dictate and control possession for Juventus, leaving Juventus susceptible to counter attacks. This situation led to Juventus conceding the only goal of the match in their October 22, 2014 1-0 loss to Olympiakos. 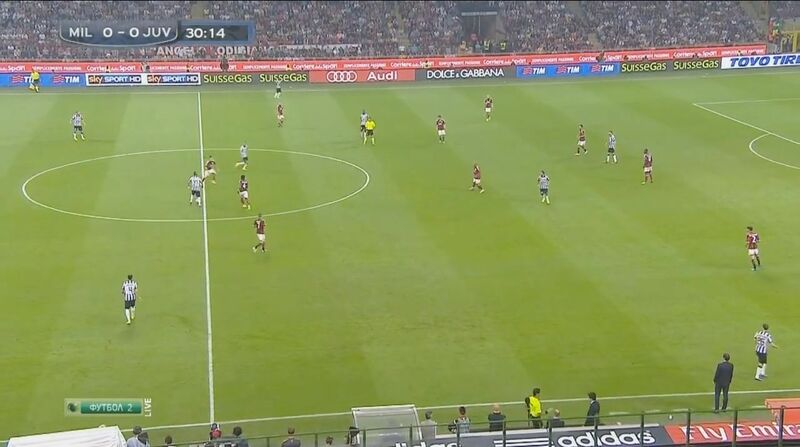 In that match, Pirlo advanced high up the field while Juventus was in possession. 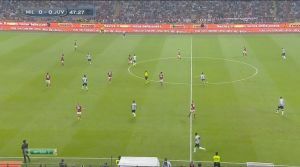 After Juventus conceded possession he was unable to track back and provide cover to his Centerbacks leaving them exposed. It seems Marchisio is the natural successor for Pirlo at the Regista not only for Juventus but also for the Italian National Team. The National team’s manager, Juventus’ previous manager Antonio Conte, is experimenting with a 3-5-2 formation that will play Marchisio as the Regista. With the history between Allegri and Pirlo and what Pirlo has come to mean for Juventus, the decision making process regarding when to transition from Pirlo to Marchisio will be a delicate undertaking for Allegri. Will he hold off on transitioning away from Pirlo because of the results of shifting Pirlo away from AC Milan? Will he shift towards his natural tendencies of playing a more physical midfield now that he has much more technically adept and intelligent central midfielders in Paul Pogba, Arturo Vidal, and Claudio Marchisio than he had at AC Milan? This decision will be a barometer of Allegri’s ability to lead Juventus to success in Europe in an attempt to complete the rebirth of Juventus as a European footballing power.